Once it gets cold out, I crave chili. This quick chicken chili recipe is one we love to make when we don’t have a lot of time to cook. I usually ask Chris to pick up rotisserie chicken on his way home from work, and the whole recipe takes about 30 minutes and can serve up to four people. 1. Heat the vegetable oil over medium-high heat in a six-quart pot. 3. Mix in the cumin, garlic, and oregano and cook for one minute. 4. Stir in the chicken and chilies. Stir. Then, add the chicken broth and one can of beans. 5. Reduce the heat to low and simmer. Stir periodically for 20 minutes. 6. While the meal is simmering, puree the second can of beans. Stir in the beans. Then, add the corn to the chili. 7. Simmer for an additional five minutes. 8. We love to add cheese and sour cream (to taste) when it’s in our individual bowls and mix it into the chili. On the first day of making this meal, we eat it as chili, but on day two, we either add chips or use it for tacos. 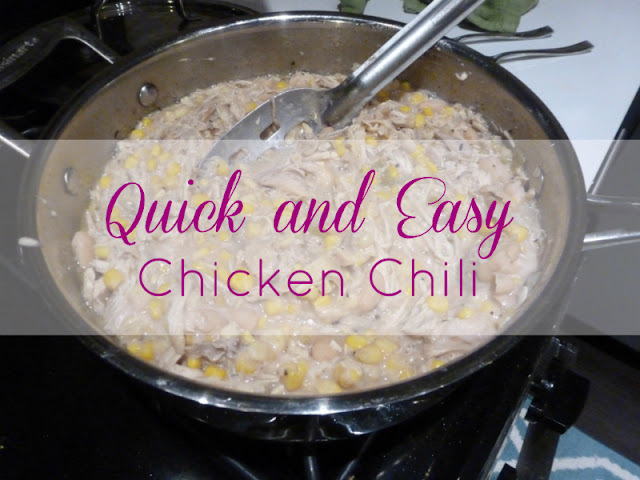 You had me at "quick and easy"...and I love that you can use this throughout the week as the base for a few different meals! Oh this sounds really tasty! I love that you could throw it together really quickly on a weeknight! Mmmmm this sounds so good! And I love quick and easy! yesssss this looks SO good. KC and I love grabbing a chicken from the grocery on the way home. normally we just eat the chicken hahaha but sometimes we make meals out of it. I love chicken chili! This looks so delicious and simple! Mmm this looks perfect for fall! I love multi purpose dishes, where you can eat it one way one night and then another way the next night. This chili looks perfect for a cold Chicago night!